"Moving around a lot, I find that cities often do not share the same restaurants. I lived in Seattle for a few years, and am now in Pensacola, FL. 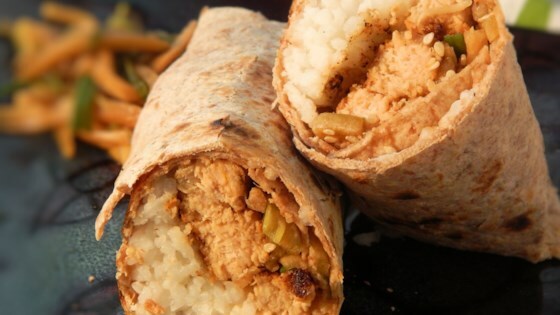 I missed the Samurai Salmon Wrap from World Wrapps. This is my effort for re-creating this taste sensation. It's a wrap with a fabulous Japanese-Asian flavor and a blend of textures to savor." Toss together the green onion, daikon radish, and cucumber in a small bowl. In a separate bowl, whisk together the rice wine vinegar, soy sauce, wasabi paste, and ground ginger. Lay to two tortillas onto a flat surface. Divide the rice and place in the center of each tortilla. Top each portion of rice with half of the salmon and half of the vegetable mixture. Drizzle half of the soy sauce mixture over each portion of vegetables. Sprinkle each with 1 teaspoon sesame seeds. Wrap the edges of the tortillas around the filling completely to serve. A delicious and nutritious wrap sandwich! Great recipe - the flavors of sushi but quick and easy to make. I used fresh ginger, which added a lot of flavor. I agree with the changes suggested below.. the canned salmon did not work for me. Tried it on lettuce and it was a little better though! I love sushi, but nori paper is so expensive. This gives me my fix! Thank you!